At Hiltingbury Infant School we provide children with physical opportunities in a fun and exciting way. We recognise the importance of children’s postural development, co-ordination and dexterity, as well as sport specific skills. Our broad, balanced and engaging PE programme wishes that all children have lifelong participation and an embedded love for sports. Understanding the importance for exercise, mental well-being and the need for a healthy, balanced lifestyle and is covered through PE sessions and cross-curricular links with Science and PSHE. Children experience a variety of team games, co-operating and competing fairly to understand their own and each others role in the game. Building this awareness is crucial to their success. Physical Education in the Foundation Stage encompasses structured physical education sessions inside and numerous opportunities in free flow using the outside space. Outside, children enjoy using the climbing frame apparatus, moving freely around the playground as well as more focussed activities such as throwing a ball or skipping. Children learn how to move confidently in a variety of ways. Children use small and large equipment to develop their fine and gross motor skills in order to gain control and co-ordination in large and small movements. Through games they learn to adjust their speed or direction to safely negotiate space. balancing, alongside dance sessions providing opportunities to explore varying body shapes to a musical rhythm. 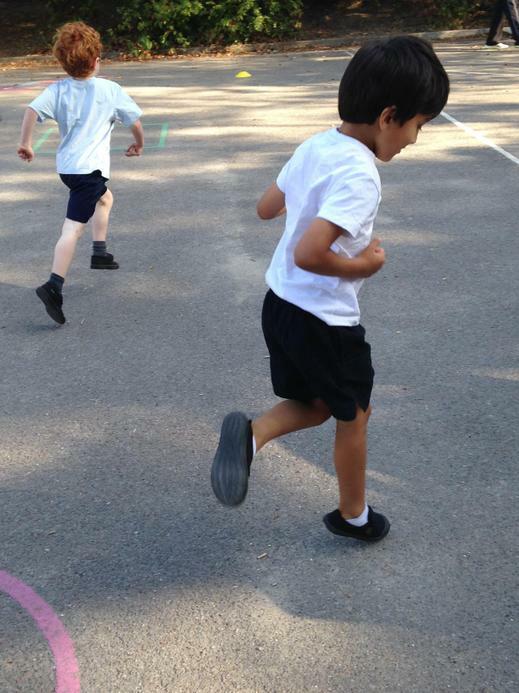 Year 2 sees children continuing to develop their transferrable and sports specific skills. R & R deliver weekly sessions motivating children and staff alike. These sessions have provided more competitive opportunities against themselves and their peers which have truly driven and enthused our passionate children. Sports including football, tennis and hockey have been delivered. Gymnastic development continues with creating and demonstrating their own sequences and more complex self-balancing exercises at different levels. At this level of education, our children use reflective learning techniques, and we have used Georgie Giraffe to improve their own work and others. Dance progresses with children creating and performing their own pieces incorporating moods and feelings.